3 bedrooms with 3 adjoining baths. Beautifully appointed ski in ski out condo. Conveniently located at the base of the Sunrise Triple Chairlift to Bear Mountain. 50 yards from your own private lift! Entrance to condo on same level as parking for convenient access. No need to go up or down stairs. A large mudroom with plenty of space and storage for gear. Large Samsung flat screen TV with high speed internet along with an elegant stone gas fireplace awaits your Après ski enjoyment. This new construction boasts a Master bedroom with a king size Tempurpedic mattress with its own private bath. Granite vanity, double sinks, shower and large jacuzzi for two. Second room has a Queen size bed with private bath. Children's bedroom has 4 twin beds and its own bathroom. Washer and Dryer including detergent and softener. A quick walk to the clubhouse which houses a Restaurant, gym, indoor pool, sauna and Jacuzzi . A large outdoor enclosed hot tub is in close proximity to a newly constructed fire pit for apres ski gatherings. Plenty of groomed trails for cross country skiing and snowshoeing. Snowshoes and cross country skis complimentary. If you have questions contact me at 617-240-6053. Views of Outer Limits and Devils Fiddle ski trails. Fully stocked kitchen from garlic press to salad spinner. Beautiful HUGE outside hot tub at Falls Brook Common for your use. Free Access to Indoor and Outdoor Pool and Indoor and Outdoor Hot tub. Gym and restaurant. Triple chairlift right outside condo. Pizza delivery from Restaurant located in the Falls Brook Common. Place was well stocked with all the paper products and kitchen supplies we needed for our stay. Dana (the owner) was very accommodating to our requests, and responded immediately to my questions. We would definitely stay here again! We loved the Sunrise ski in/ski out location and proximity to Bear Mtn. Set up wonderful for 2 families. Can’t wait to return! Our best Killington experience to date! Travelling with friends (4 adults and 4 teenage kids), this place couldn't have been better! 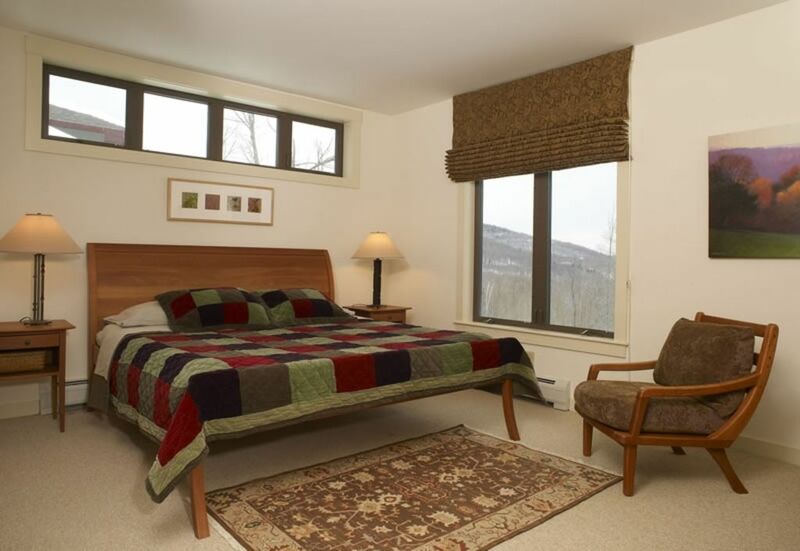 Very comfortable, beautifully decorated, very well stocked, and perfectly located by the Sunrise lift. Visited the Sunrise clubhouse for the first time and was impressed, great bar, pool, and hot tubs. Dana was very kind and helpfull with all our needs and always responded very quickly. This property exceeded all our expectations, and we will definitely be back in the future. Thanks! Amazing condo right on the slopes! Beautiful, perfectly planned, with three totally private, separate suites. This was exactly what we were looking for, traveling with young children and grandparents. We all had privacy but also a very cozy common space to spend time together in.The beds were very comfortable and the jacuzzi in the master an extra treat. Can’t say enough good things about Dana’s place or Dana, who was so responsive and accommodating to our every need. Forgot to mention the great clubhouse with the indoor pool and jacuzzi. We loved the condo and had a great time! The condo was very nice, up to date, clean, and well stocked with towels, sheets, soap, dishes etc. The location was perfect, with a ski in / ski out option at the sunrise lift. We enjoyed the pool, hot tub, sauna and steam room. Dana was super responsive and helpful and made us feel at home. We will definitely be back! The condo is beautiful, well decorated and clean. Dana was very helpful and accommodating. We would stay here again! $750 for normal non-Holiday weekend nights. $875 for Christmas, MLK, February ski week. Any other configurations are negotiable! dgould@logixinc.com Email me!